Hotel Le Richemont offers spacious and elegant rooms in Paris’ 13th arrondissement, also known as the Asian Quarter. All of the rooms have flat-screen TV and free WiFi internet access. They are also easily accessible for guests with disabilities. Ironing facilities are at guests disposal in a dedicated room. Travel adapter and luggage scale are also available upon request at the reception. The hotel is located close to the Metro Olympiades (Line 14) that offers direct access to Chatelet-Les-Halles and Gare de Lyon. It is a 20-minute walk from Bercy Village, where guests can visit shops and restaurants. AccorHotels Arena is located 1.8 km from the property. Children's breakfast is available for € 8 per child. Guests are required to show a photo identification and credit card upon check-in. Please note that all Special Requests are subject to availability and additional charges may apply. 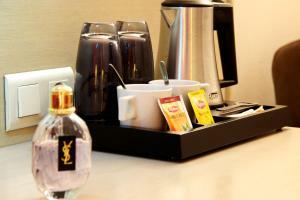 All rooms feature a courtesy tray, a satellite TV, free Wi-Fi and a minibar. A hairdryer and a length mirror are also included. A stroller, high chair, a bottle warmer and a baby cot are available upon request. Please note that Cheques Vacances holiday vouchers are an accepted method of payment. Rate: € 80.00 ... € 256.00; select dates below to get current rates. All rooms feature a courtesy tray, a satellite TV, free Wi-Fi and a minibar. A hairdryer and a length mirror are also included. A stroller, high chair, a bottle warmer and a baby cot are available upon request. This quadruple room features a minibar, air conditioning and electric kettle.